Follow up letter after interview help. This is an important step in your job search success. It may not get you the job but if you do not send a professional and well-written follow up letter you are certainly limiting your chances of success. 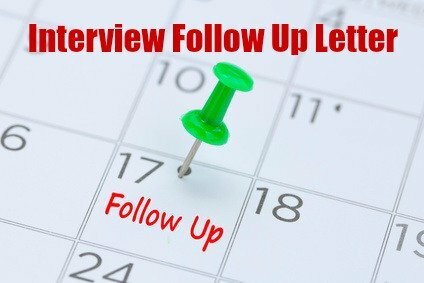 Find out what you need to address in your interview follow up and use the sample letter or follow up email to conduct your own effective follow up after the job interview. Know the information a potential employer wants in your follow up letter. A potential employer will have certain concerns and questions about any job candidate. The interviewer will have tried to answer these questions about the candidate's suitability by asking the right job interview questions. Does the candidate have the necessary skills and experience to do the job? Will the candidate work hard and be reliable? Will the candidate be able to learn the job quickly enough? Will the candidate get on well with other employees? Will the candidate take responsibility and be able to work independently? How enthusiastic and committed is the candidate? If hired, will the candidate leave after a short period? Can I trust this candidate and the information he or she has given me in the interview? It was a pleasure meeting with you this morning regarding the Sales position. I enjoyed learning more about the job opportunity and ABC Company. The position is exciting and I am enthusiastic about the challenges it offers. I am convinced that my experience in building a dedicated customer base and my track record in generating new business will allow me to successfully meet these challenges. With hard work and commitment I believe I can make a significant contribution to the achievement of the company's long term goals. I enjoyed meeting your colleagues and would consider it a privilege to become part of your team. I am confident that my ability and willingness to learn quickly will allow me to integrate myself and become a productive member of the division from the start. Thank you again for the informative interview. It certainly confirmed my keen interest in the job opportunity. Should you require any additional information or references please don't hesitate to contact me. 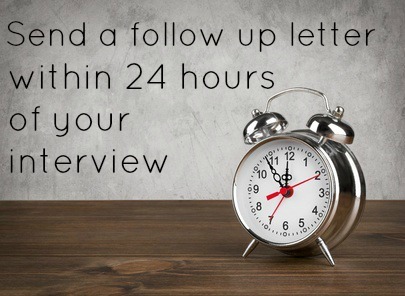 When should you send a follow up letter after an interview? The follow up letter or email is both a thank you note and a confirmation of your suitability for the job. It should be sent within 24 hours of the interview. This sample interview follow up letter offers the company the assurance that you can positively address the concerns they are likely to have about a job candidate. The sooner you send it after your interview the better to cement your place as the preferred job candidate. Organizations are more worried than ever about how a candidate will work out if given the job. They want a guarantee that you are going to increase their effectiveness and contribute to the bottom line if they employ you. No company can afford to make a wrong hiring decision. Your follow up letter after the interview should offer them peace of mind that you are an enthusiastic and capable candidate who will work hard and succeed in the position. Set yourself apart from the competition with a well written interview follow up letter or email. The guide to interview thank you letters answers your questions about how to follow up properly after the interview. 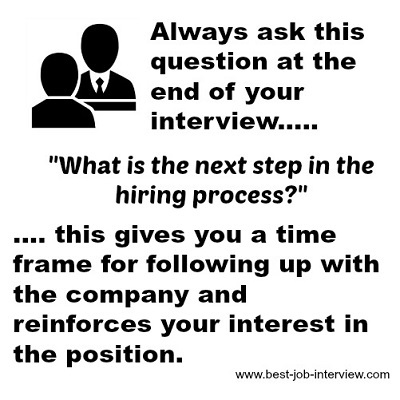 Closing the interview properly will help you follow up in the right way.